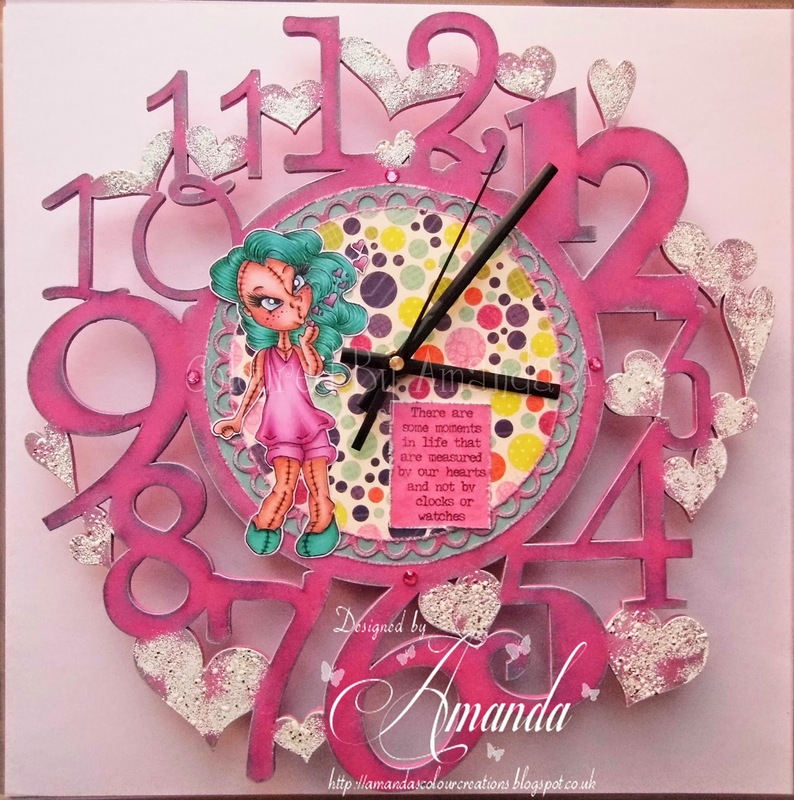 Amanda's Colour Creations: Time for Hearts. Well today i have been making something different. 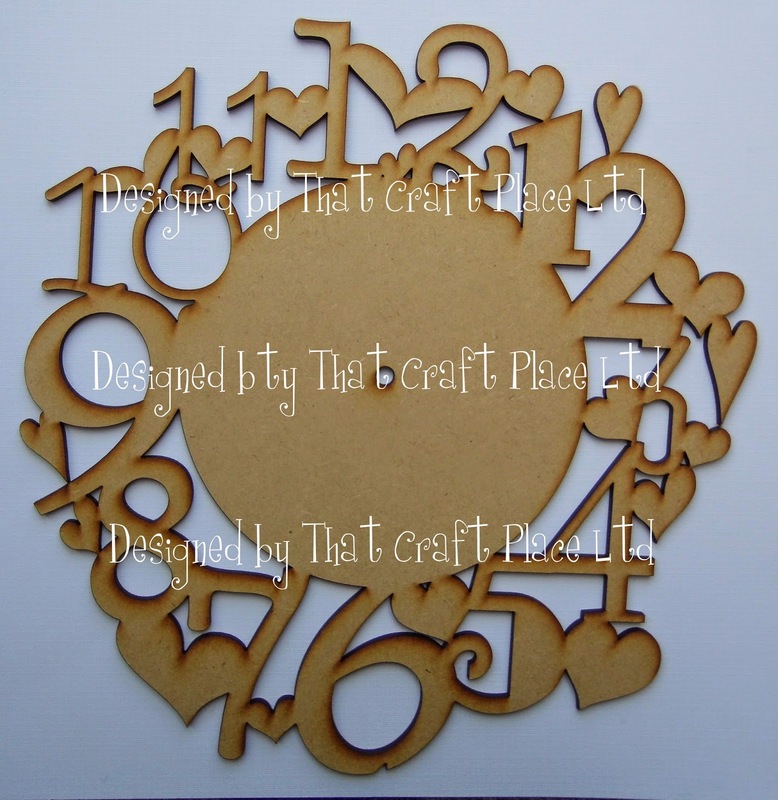 A few months ago Lisa the owner of That Craft Place Ltd cut a Laser MDF Clock with Stars on which was very nice but i wanted something different so i asked her if she could do a clock with Hearts on as i am Crazy for anything with Hearts!! 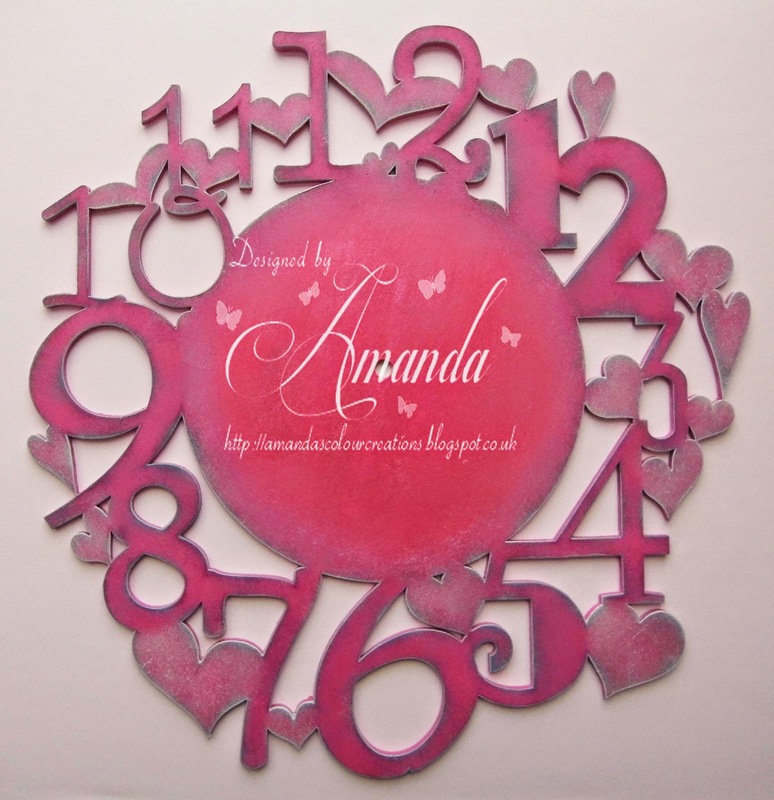 So the Amazing Lisa went off and designed this amazing Heart Clock. So then it was my turn to try and make it look pretty. First I painted a layer of White Gesso to Prime it. Next I painted it with Do Crafts Pink Acrylic Paint, then Dry Brushed all edges with Turqouise, then Light Blue and lastly with White but putting more on all the Hearts . Next i wanted the Hearts to be Pretty looking. So i used Ranger's Emboss It Dabber and randomly dabbed on the Hearts and sprinkled on Stampendous Shabby Blue and heat Emboss it. Here's a close up of the embossed Hearts but sadly you can't see the glitter very good in the photo. Next i decorated the middle with papers & cut a Sweet Dixie Doiley. Then i used the image Love From Sugar from That Craft Place Ltd on Etsy. Coloured her in Copics and hand cut her out. Added a few gems and the clock is finished. Hi Liz, thankyou. I never thought to seal the papers with it only being inside but I think it should be ok or I would use a matt varnish. WOW this is AWESOME! Great job! Thanks so much for playing in our ‘ANYTHING GOES’ challenge at Dies R Us! Please come back again soon! 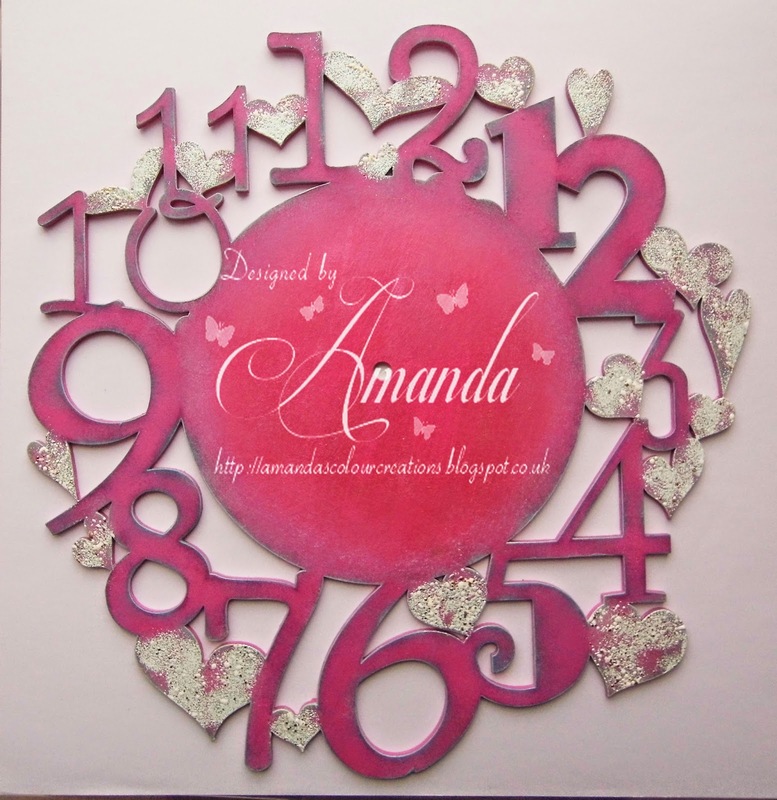 Really gorgeous clock and I love all the sparkly hearts, Amanda! Thanks so much for playing along with us at ATSM this week! What a great design and awesome project!!! Thank you for joining us at "Dies R Us" for our "Anything Goes" challenge!! Awesome project! Love your great design and the sparkly hearts! Thank you for sharing at ATSM. 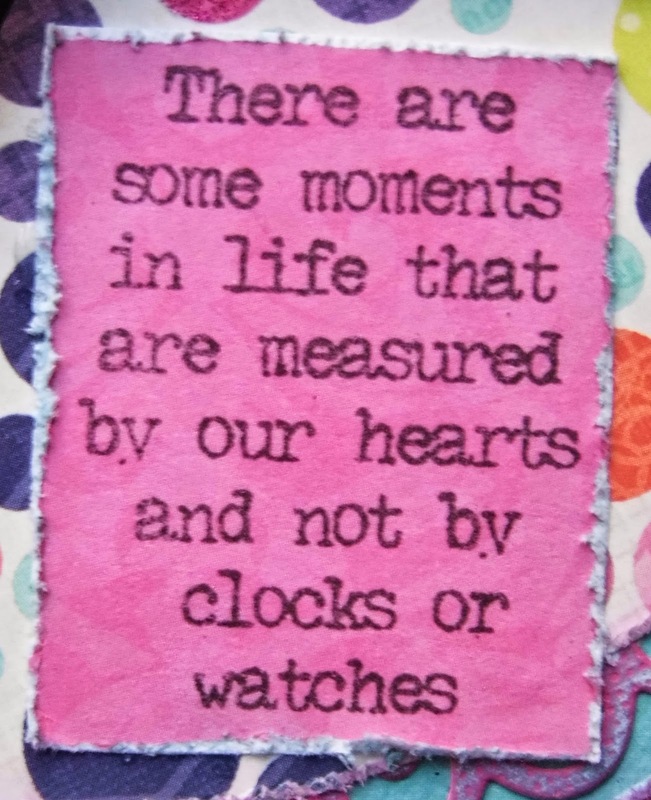 It's an amazing clock and I love the way you have decorated it, the sentiment is lovely too, I want this !! Thanks for joining in with the Sisters of Craft Challenge and good luck ! Best Wishes, Anne DT. WOW WOW - I just love this card!!! Thanks so much for joining us at Scrapper's Delights this week. Hope to see you again! Thank you for joining us at Sparkles Monthly Challenges this month and Good Luck. We hope you join us again. Gorgeous - a beautiful piece of artwork and it was great to see the step by step photos.